Asking me what types of orchids there are is like asking me what types of people there are. Well, there are tall and short people, smart people and not-so-smart people, introverts and extroverts, people with different skin colors, and people from different parts of the world. Likewise, you will find many different types of orchids—different colors, species and hybrids, miniature and standard-sized, all different genera from different parts of the world. So I will narrow the question a bit, and look at it in terms of the orchids you will likely to buy and grow. In the wild, Phalaenopsis are epiphytes and grow on trees in a constantly moist environment. They usually have long flower spikes and therefore look very graceful. These types of flowers have the power to add elegance to the home and brighten up a dull atmosphere, even if your boyfriend leaves his socks on the floor. 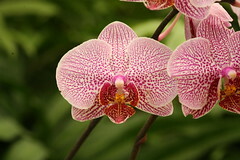 Phalaenopsis are now widely grown as houseplants. Even though they usually bloom only once or twice a year, their flowers can often last for two to three months. Learn more about Phalaenopsis orchids. Another type of orchid you can grow at home is what I call the “Thai restaurant orchids.” These types of orchids are Dendrobium hybrids and can be found at Thai restaurants that decorate their tables with freshly-cut flowers. They come in many colors (white, green, purple, pink, yellow and more) and require a fairly warm environment. In fact, they could loose their leaves in the winter when the ambient temperature drops below 60°F (15°C) or so. 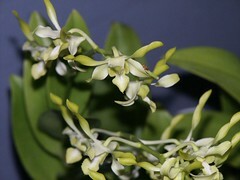 But the “Thai restaurant orchid” is really just one small group of hybrids within the Dendrobium genus. Dendrobium is actually one of the largest orchid genera. Dendrobium species live as epiphytes and lithophytes in New Guinea, Southern China, Thailand, Japan, Australia, New Zealand, Tahiti and more. As a result, it’s hard to generalize how to care for these types of orchids. Some of them require cool nights of 50 to 59°F (10 to 15°C) while some of them require warm temperatures in the 80s°F (27°C). That’s why it’s so important to understand their natural environment so that you can make them happy. Learn more about Dendrobium orchids. My favorite type of orchid is the lady slipper orchid because of their strange appearance. They are like no other types of flowers and have pouch-shaped lips. 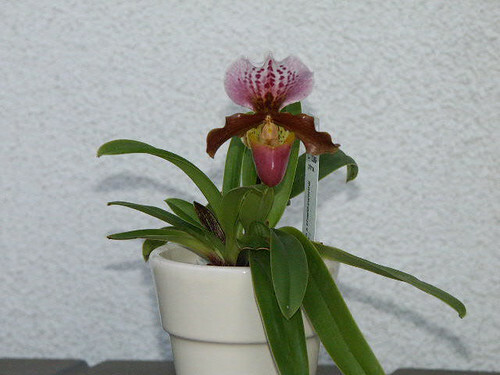 The mostly terrestrial and lithophytic slipper orchids include four genera—Paphiopedilum, Phragmipedium, Cypripedium and Selenipedium. But most Cypripedium and Selenipedium are not plants for the beginner because they can be quite difficult to grow under cultivation unless you live in temperate regions with Cypripedium growing wildly in your back yard! You can readily buy Paphiopedilum at fancy grocery stores, and if you can’t find them, find a fancier store where women shop with little dogs in their bag! While these types of flowers come in girlie soft pink, eye-catching yellow, innocent white and other soft colors, many of them are dark red, brown and green with hairy and warty petals. The infamous Paphiopedilum sanderianum from Borneo has lateral sepals (the side petals) that can hang down 3 feet (1 meter) long! This highly sought-after plant can cost hundreds of dollars. But there are plenty of wonderful Paphiopedilum plants out there that don’t cost an arm and a leg. Learn more about Paphiopedilum orchids. Here in Southern California, one orchid that grows extremely well is the boat orchid, Cymbidium. These types of orchids have been grown and depicted in drawings and poetry for more than two thousand years since the time of Confucius. They are still popular plants today because of the big, showy and long-lasting flowers. The pink, yellow, green, red, brown, peach or combination colored flowers also last superbly as cut flowers—if you change water daily and cut back the bottom of the spike, they can look pristine for a month or two in the vase. Speaking of cut Cymbidium flowers, my friend has several outdoor Cymbidium and the once-a-year flowering always brought her lots of joy and pride. It’s like an annual EXPLOSION of flowers that fills her whole back yard! Right before the prom, their teenage neighbor forgot to get his date some flowers, and for some reason, he thought it was okay to make a bouquet out of these Cymbidium flowers without any permission. She was so upset about the loss that the thoughtless boy had to make up the mistake by working in her garden for the rest of the year. The moral of the story? If you decide to steal someone’s orchids, you’d better not get caught! 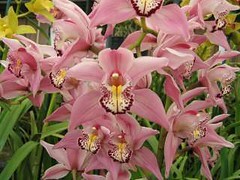 Learn more about Cymbidium orchids. I can go on and on about other types of orchids, but I would probably go a little crazy by the time I am done going through the 700 or so genera, more than 25,000 orchid species and more than 100,000 hybrids. However, there are a lot of fascinating orchids you really should not miss, so visit my other pages to learn more about those orchids.